Pilot Butte School District No. 207 was established in the North-West Territories in 1891. The first school was located south of the village on the present access road. The teacher was Andrew Martin, who later became a medical doctor. Children by the names of Betteridge, Zinkhan, Knappel and Weisbrodt attended that school. Some of these family names are still found on recent registers. 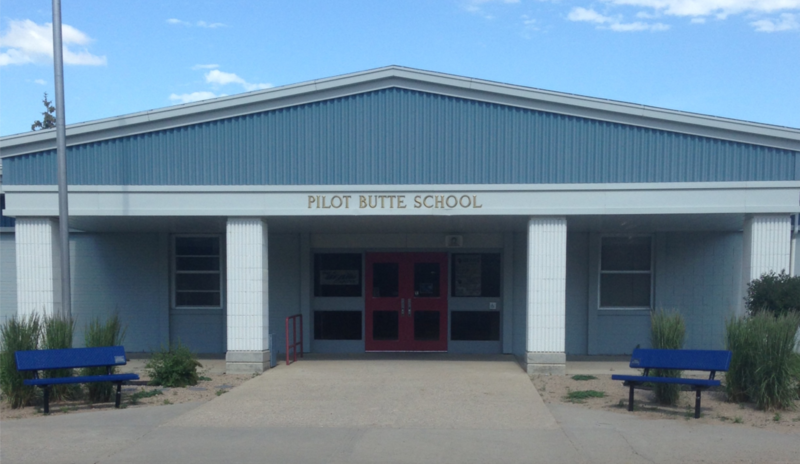 In 1913, Pilot Butte School was relocated to the present school site in the village. A two storey, two classroom school was erected, using the red bricks manufactured at a Pilot Butte plant. Thirty-seven students were enrolled from grades one to ten. This building also served as a community centre. The brick structure was replaced by a two classroom stucco school in 1956. The population of the village increased rapidly and in 1958 the basement was turned into a classroom. A rural school was moved to the north end of the school yard for extra space. In January of 1960, a two classroom cement block building, capable of future expansion, was opened at the southwest corner of the school yard. In 1964, Pilot Butte became part of the newly formed Regina School Unit No. 21. Expansion of the two room cement block structure began at once. Four classrooms were added to the north in 1964 and four more in 1974. A large addition built to the east in 1977 included a library and small gymnasium. An expansion and renovation in 1988 has resulted in a modern school with eighteen classrooms, several specialized areas, a large gymnasium, and an elaborate playground.